(WOIO) - A teenager is behind bars, after police say he tried to rob a postal worker in broad daylight -- and this wasn't the first time. At the corner of Bryn Mawr Avenue and Parkwood Drive shortly after 10 a.m. Tuesday, Wickliffe Police say a 17-year-old waved a gun at the female postal worker as she was walking her route. The robbery was foiled by Flanagan, even though he was caught off guard. "She came over to get my letter and that's when she saw me as someone who could help," said Flanagan. The teen got nervous and fled. The postal carrier then called 911 as Flanagan kept his eye on the would-be robber. Her detailed description helped police locate the teen. "He is in black sweatpants and a gray hoodie, and he's carrying a gun in the right hand pocket," she told 911 dispatch. Police say the suspect immediately fled on foot with officers giving chase through several back yards in Euclid. Other Wickliffe and Euclid officers set up a perimeter, eventually catching the suspect in the backyard of a home in the 200 block of Lloyd Road in Euclid, after he was seen trying to hide the weapon in a snow pile. 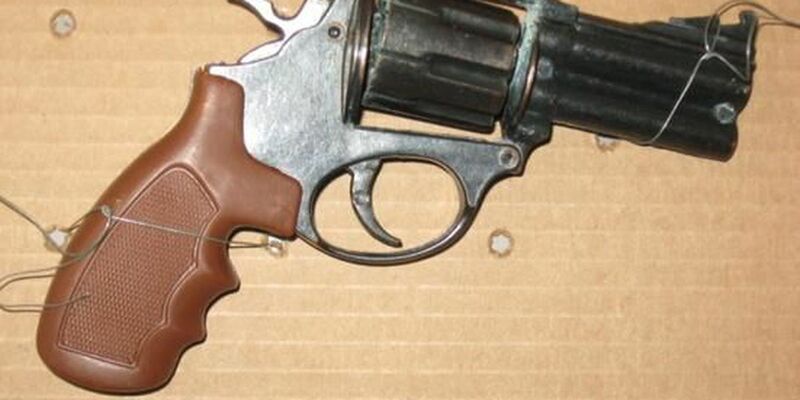 It turned out to be a plastic toy gun with the orange tip removed. Once in custody, the teen confessed. "He kept saying to us, 'It's not a real gun. It's not a real gun.' I don't think he understood really how it looked to other people, whether it be a police officer, or those other people with a concealed carry weapon," explained Sgt. Jim Coolick. According to Coolick, the 17-year-old also robbed a postal carrier in Euclid in the area of Lakeshore Boulevard and East 276th Street, about 30 minutes before heading to Wickliffe. Flanagan says he just happened to be at the right place at the right time. "I looked for her, actually, coming back from the gym to see if she was OK. But evidently, she was home by then. I hope she is OK," he said. The suspect is being held at the Lake County Juvenile Detention Facility and will face charges of aggravated robbery, tampering with evidence, and obstruction.